macOS probably isn’t the best platform to process Blu-ray/DVD media files. But if you want to extract audio from DVD, you can still find a decent DVD audio extractor on Mac that you can use. And in fact, if you want to get the audio from a DVD, there’s more than one way to achieve that. Other than using a DVD audio extractor Mac users could also try using audio recording software to record DVD audio to MP3 or other audio formats. In this post I will show you how to use a DVD audio extractor to extract audio from DVD and use an audio recorder to record DVD audio to MP3. Most people would tend to keep things simple. 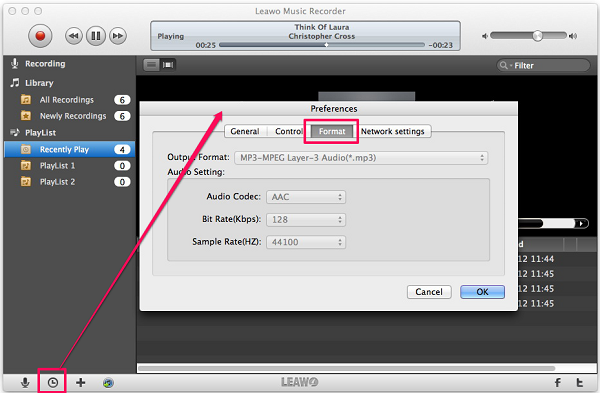 If you are one of those people and want to keep the audio extracting process as simple as it can, you should check out Leawo DVD Ripper for Mac. It’s a simple but powerful DVD ripping program which can rip DVD to popular video format like MP4, MKV, WMV and audio format like MP3, WAV, FLAC and more. It can also decrypt protected DVDs so even if the DVD that you want to extract audio from is copy protected, you’d still be able to extract audio from it. It’s one of the best choices to rip DVD to audio Mac users should try. Here’s how this DVD to audio converter works. Step 1. 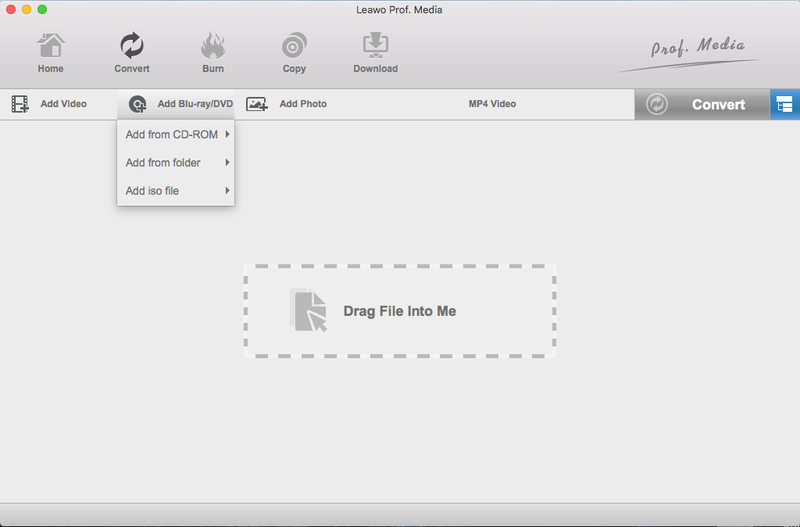 After going through a few updates, Leawo DVD Ripper for Mac had gone through the process of becoming a module in a software suite from being an independant program. It’s now a module in Leawo Prof.Media. 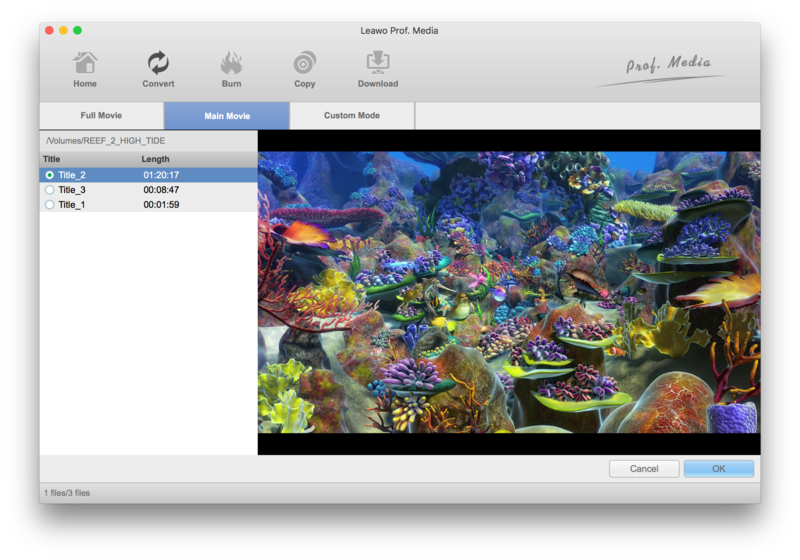 So don’t be too surprised when you find you’ve installed Prof.Media instead of Leawo DVD Ripper on your Mac. Just fire it up as you see it on your Mac and find the DVD Copy button. Click on the button to load the DVD Copy module. Step 2. You can have the DVD disc put in your disc drive in advance or after the first step. And then you can import the movie and other content to the program by clicking Add Blu-ray/DVD>Add from CD-ROM>[your disc]. Step 3. All the videos in the disc will be imported and listed on the following page on the left column. You will find 3 buttons on top of the left column. by choosing different buttons will have different videos added to the DVD to audio conversion list. Choose Full Movie and all the videos will be chosen. Choose Main Movie and the longest video will be chosen as the longest video in a disc is usually the movie itself. Use Custom Mode to choose the video from the list manually. Click OK to confirm your choice and the chosen ones will be added to the conversion list. Step 4. Choose an audio format that you want to convert the DVD videos into by clicking the Format button which is the second button from the right on the row of buttons on top of the video list. A menu would appear under the button, click Change to open the Format list. And then go to Format>Common Audio and select an audio format you want. By clicking on the format it will be set as default and take you back to the video list. You can click on the Format button again and click Edit to go to the Profile Settings page to make changes to the parameters of the audio format you just select. Parameters including Audio Codec, Sample Rate, Bit Rate and Channel can be changed according to your requirements. Step 5. Click the Convert button and set the location for the output audio file on the following sidebar. And then you can click the Convert button on the sidebar to start the DVD to audio conversion. As I’ve mentioned previously, you can also record the audio from DVD. 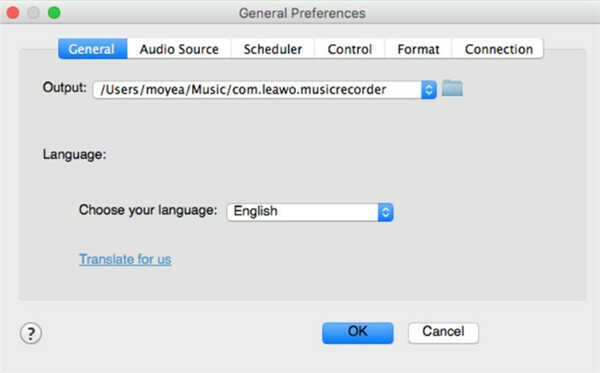 The program I’m using for the DVD audio to MP3 recording process is Leawo Music Recorder. It can easily record audio from all kinds of audio sources and it’s an easy-to-use and compact program. 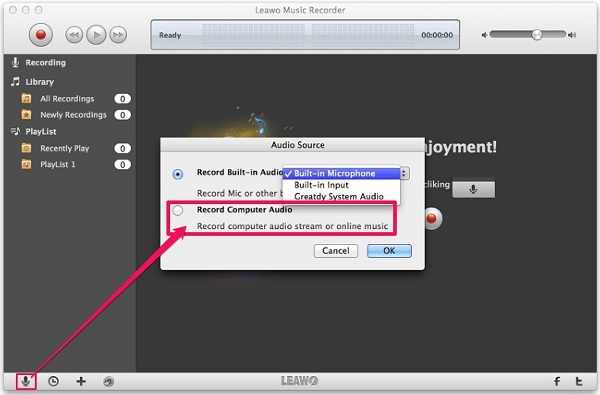 Here’s how to use the program to record DVD audio to MP3. Step 1. 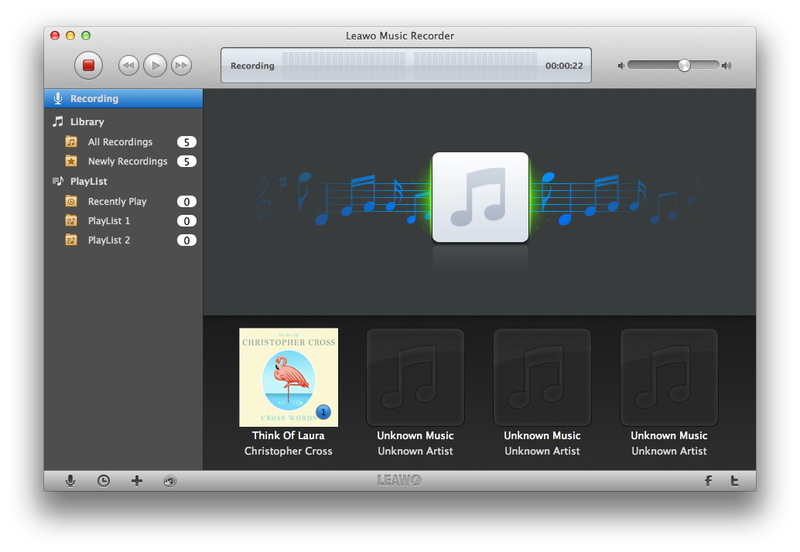 Open Leawo Music Recorder. First we’ll have to set a few things up before starting the recording. The first thing to set up is the audio source to record. Click the Microphone icon in the bottom left-hand corner. And on the following popup, click the Audio Source tab on the top. As you are recording DVD audio to MP3 on your computer, check Record Computer Audio. Step 2. Click the Format tab at the top and select MP3 as the default format for the recordings. Step 3. Click General and set a location for the recordings. Step 4. Click the Start Recording button in the top left corner to start recording and then start playing the DVD on your computer. Remember to start recording first so the recording won’t miss anything. Both programs can work nicely as a DVD audio extractor Mac users could try. 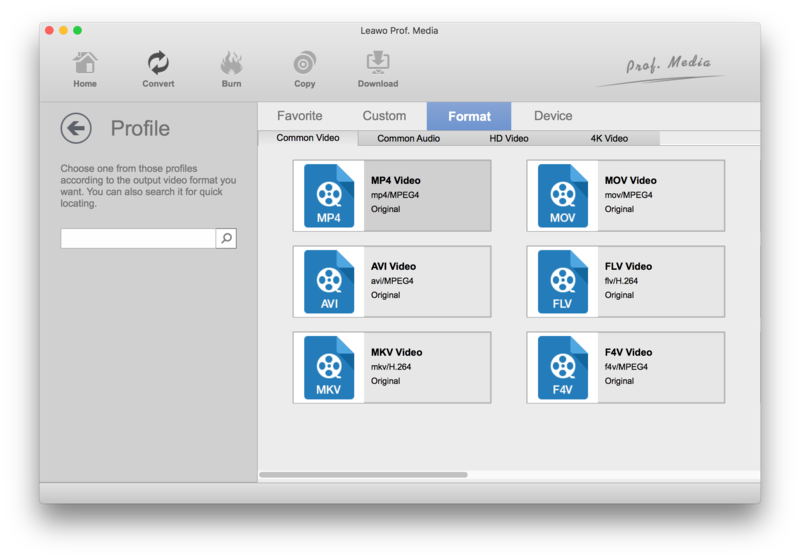 If you need, you can even use Leawo DVD Ripper for Mac to rip and convert DVD to common video files so that you can play DVD movie on Apple TV or other devices you have.